With school getting ready to start back up soon, I know I need to be prepared for those hectic mornings where getting the family fed becomes an on-the-go task. When I have spare time, I love making wholesome, baked breads or muffins to have on hand for those days when cooking breakfast just isn’t going to happen. 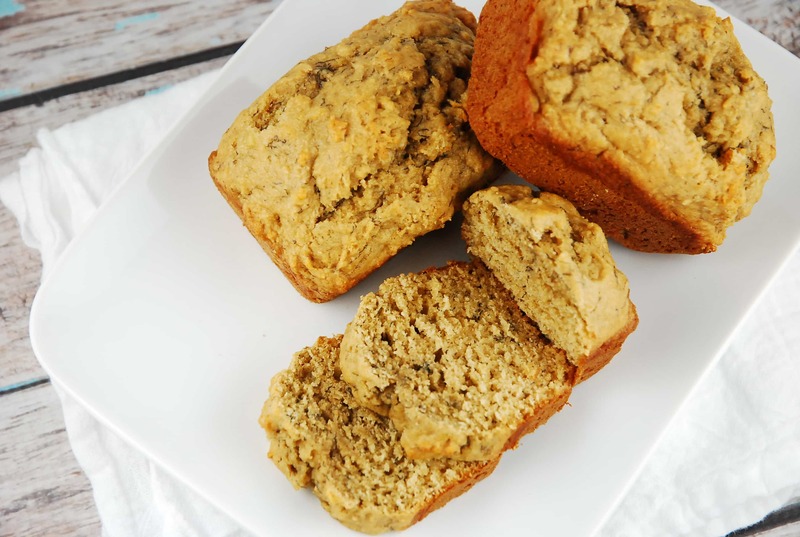 These Whole Wheat Banana Nut Mini Loaves are ideal for this exact situation. Made with all clean ingredients, healthy fats, and nothing artificial, they are nutritious as well as incredibly moist and delicious. I like to make them in mini loaf form because my kids think it’s super cute. But, alternatively, you can use mini muffin cups instead. Both options make them easily accessible and portable! This banana bread recipe will leave you feeling happy and satisfied. Enjoy! Moist, decadent and wonderfully flavorful, these naturally sweetened make a perfect portion controlled treat. Enjoy with your morning coffee or tea, or even for dessert. Preheat oven to 350. Spray a mini loaf pan with non fat cooking spray. In a large bowl, combine flour, baking soda, baking powder, salt. Make a hole in the center of the flour mixture, then add in the eggs, honey, butter, honey, and applesauce. Mix until just combined. Using a rubber spatula, fold the bananas and walnuts into the batter. Evenly distribute into 12 mini loaf cups (alternatively, 36 mini muffin cups). Bake until the top is golden brown, and a toothpick comes out clean, when inserted in the center. About 20 minutes (alternatively, 12-15 for mini muffins). Love you site, but wish there was a print option.